5.19. Digital transformation will enable us to make big strides towards forging a lifelong relationship between people and the NHS. Alongside the face-to-face contacts that remain important to many people and for many conditions, people will be able to use technology to access and interact with health and care services seamlessly. 5.20. Patients, clinicians and the carers working with them will have technology designed to help them. They will have a digital service for managing their interactions with the NHS, a view of their record, care plan, expectations, appointments and medications, to enable care to be designed and delivered in the place that is most appropriate for them. 5.21. If people need NHS advice or care, they will have increasing digital options. A secure NHS login will provide access and a seamless digital journey. The NHS App and its browser-based equivalent will enable people to follow a simple triage online to help them manage their own health needs or direct them to the appropriate service. If needed they will be able to be connected with their local services; get an appointment with an urgent treatment centre, out of hours services or GP, or be prescribed medicine to be collected from their nearest pharmacy. Increasingly, automated systems and AI will make these services smarter, but in-person services will always be there to do what computers can’t and provide personal contact for those who need or want it. And as set out in Chapter One, over the next five years, every patient will be able to access a GP digitally, and where appropriate, opt for a ‘virtual’ outpatient appointment. 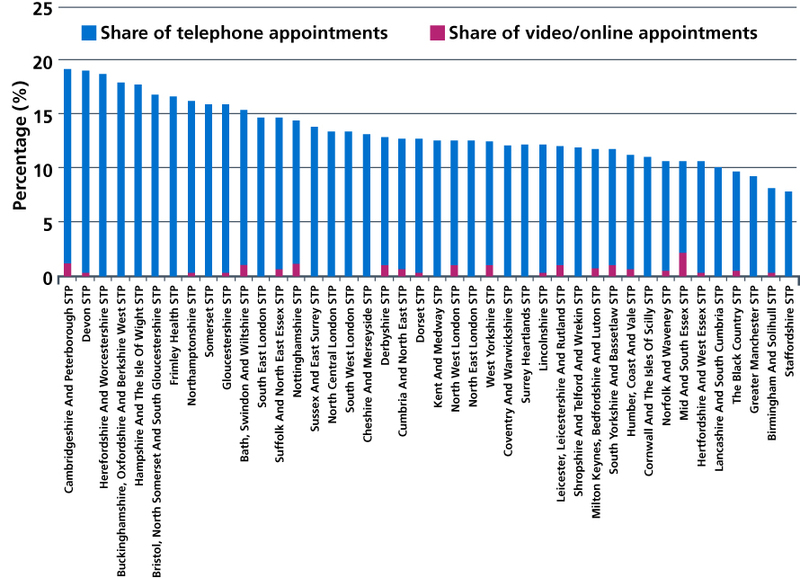 Figure 24: Current share of GP appointments by phone, video or online, by STP. Source: NHS Digital. Appointments in General Practice. October 2018. 5.22. The NHS cannot fully embrace the opportunity offered by new technologies if many hospitals and services remain largely paper-based. The Secretary of State has announced that NHS organisations will from 2020 no longer use fax machines to communicate with other NHS organisations or patients. All providers, across acute, community and mental health settings, will be expected to advance to a core level of digitisation by 2024. This will cover clinical and operational processes across all settings, locations and departments and be based on robust, modern IT infrastructure services for hosting, storage, networks and cyber security. To support this, we will accelerate the roll out of Electronic Patient Record (EPR) systems and associated apps, including a spectrum of Software as a Service (SaaS)/Cloud-based variants. Provider digitisation will be implemented to nationally agreed standards to enable integration with the LHCR to provide patient-centric and clinician-centric digital user journeys across all health settings. 5.23. A new wave of Global Digital Exemplars will enable more trusts to use world-class digital technology and information to deliver better care, more efficiently. The continued roll-out of GDE blueprints to more Fast Followers will ensure the NHS achieves maximum value by reducing duplication and sharing systems between organisations where possible based on open standards and interoperability. Central funding will be made available to trusts (subject to an upper limit) to help them meet mandated standards and technical requirements. 5.24. Technology will enable the NHS to redesign clinical pathways. Easy access to referral decision trees, referral templates and direct access to investigations that reflect evidence-based best practice and universal access to ‘one click away’ specialist advice and guidance for GPs, will avoid many patients from requiring referral for an appointment. Triaging (and potentially completing) some specialist referrals such as in dermatology with photos and questionnaires will allow some patients to be managed entirely digitally. Virtual clinics with escalation to face-to-face appointments where needed – such as the virtual fracture clinics run in Bradford and renal care in Tower Hamlets – can replace follow-up appointments for many conditions, as set out in Chapter One. 5.25. By 2022, technology will better support clinicians to improve the safety of and reduce the health risks faced by children and adults. An integrated child protection system will replace dozens of legacy systems and we will deliver a screening and vaccination solution that is worthy of the NHS’ world leading services.